MIDLAND METRO LINE 2: The second phase of the Midland Metro is now due for completion in either 2010 or 2011, and work begins before the end of next year. The Tipton Road overbridge in Dudley has already been rebuilt, and it will make use of the South Staffordshire Line between Wednesbury and Brierley Hill before carrying on a few hundred yards through the edge of the Merry Hill complex and finally terminating in Brierley Hill town centre. The goods train link between Round Oak and Walsall will also be re-opened; it closed in 1993. MIDLAND METRO LINE 1: Most of the Midland Metro Line 1 was closed as a railway in 1972, but the stretch between Wednesbury and Bilston remained open until 1992 as a rail link for a large scrapyard near Bilston town centre. This is a very interesting website full of fascinating information about the railways in the midlands. It has given me plenty of knowledge about things which I previously had little or no knowledge of. 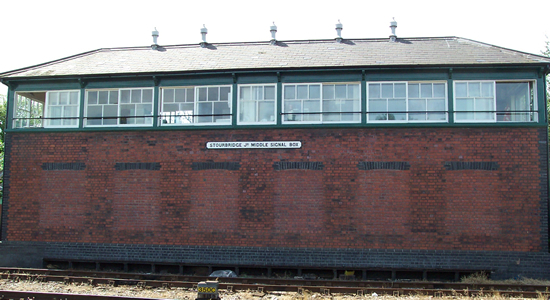 I have located the former station master of PENNS for Walmley station and will be going to interview him soon! Very nice & informative site! Having visited the Birmingham area - especially the southern part of the BCN - a year a ago, this website expertly answers the questions that had arisen about i.e. the area around Granville Street Station and Dudley Port Low Level Station! Lovely site. One quick question. With the rail lines heavily used, roads jammed and passenger traffic taking off, why isn't anyone looking into re-opening the Wombourn branch? It's not even built on...Any thoughts? You say you get lots of letters about it, what do they say? Just information? Just curious..
That's fascinating Brian, I don't recall ever coming across a mention of that station but will certainly investigate further and see if I can get a firm location. If you happen to know the exact spot, please let me know. The photograph of Knowle and Dorridge Station is taken looking towards Birmingham, not Leamington Spa. I used to cross the footbridge shown daily in the 1950s and 60s. The photographer is standing on platform 2, with platform one and the booking hall across the line, and Station Approach beyond. Well-spotted Sue! Thanks for that, appear to have got my bearings wrong when I was commenting on the 1885 shot on the Postcards page. Well done in getting the guestbook up and running again - looks like you have sorted out the problem of those who trashed it with spam. Just found a set of photos which may interest people - they can be found at http://www.flickr.com/photos/loose_grip_99/sets/72157594227939322/. I worked briefly in Birmingham in the mid 1970's and remember Snow Hill exactly as depicted here - unfortunatly I never had a camera and there was not enough time in my lunch hours to properly explore it. Guy, it took a while but I finally got around to coding a Guestbook from scratch with a few built-in safety measures that, touch wood, up until now have prevented any unsavoury spamming messages from appearing. Thanks for the URL also, many interesting pics on there. In fact, I was so taken that I've started a gallery on there too! Hi. Just stumbled across the site via link from Made in Birmingham site. Excellent. Many thanks.